The SkinStylus® Microtherapy System is a revolutionary treatment protocol designed for skin care professionals, BY skin care professionals that includes a state of the art automatic needling device stylus with both corded and cordless options, a professional EstheCeuticals® regimen, and an optional AirStylus™ ambient air delivery unit. Used as a system, SkinStylus® provides skincare professionals the ability to offer exceptional results with a fractional treatment (beautify the skin) that has little to no down time for the patient. I’ve seen needling devices for sale on Ebay and Amazon. How is the SkinStylus® Microtherapy System different? There are many different brands and varieties of needling devices available for purchase on the Internet. At SkinStylus®, we have taken the time and spent the money to purchase virtually all of these systems and tested them for durability, safety, and effectiveness. In our testing, we could not find a system that did not allow liquids to leak into the motor, nor were there any systems that could be autoclave sterilized. Because cross contamination is such an important issue, we engineered the SkinStylus® Microtherapy System with a leak-resistant Biolock™ needle cartridge and designed the SkinStylus® motor unit nose cones to have the ability to be autoclave sterilized. Another important regulatory factor to consider, even if there was a comparable system for sale on the Internet, skincare professionals would be REQUIRED to go through the exceptionally costly process to register the needling device and their facility with the FDA every year or face severe FDA penalties. Additionally, liability and malpractice insurance will most likely not cover any claim made by a client if an unregistered device was used. It is not worth the risks when the SkinStylus® Microtherapy System is priced so competitively and provides an autoclave sterilizable device. Who designed the SkinStylus® protocols? The SkinStylus® Microtherapy System is the only system endorsed and used by Kristin Groop, noted Esthetic Educator, contributing writer to Les Nouvelles magazine (June 2014 edition topic on microtherapy) and guest educator at The International Congress of Esthetics and Spa, lecturing on microtherapy. Kristin is a licensed esthetician, licensed esthetic instructor and has been instructing in the medical esthetics field for over 9 years. She was instrumental in developing both the EstheCeuticals® product line for microtherapy, and the SkinStylus® Microtherapy System including the education. Dr. Lawrence Groop developed the educational programs for SkinStylus®. Dr. Groop has spent the last five years researching collagen induction therapies and cutaneous wound healing. Why should you choose the SkinStylus® Microtherapy System? Up until SkinStylus® other microneedle distributors offered either ONE corded needling device or a cordless device at a far higher price point than SkinStylus®. The SkinStylus® Microtherapy Professional Gold System provides TWO microneedle devices BOTH that can be operated as corded or cordless devices. Two batteries and four sterilizable nose cones are provided, as well as EstheCeuticals® products, 40 needle cartridges, 40 3 ml packets of NumbsUP! topical anesthetic, and 40 patient brochures. The entire SkinStylus® Microtherapy System provides all of this with a one year warranty at a price below any competitor with a professional grade needling device. The SkinStylus® Microtherapy System is registered with the FDA. More importantly, the SkinStylus® Microtherapy System can be autoclave sterilized and has a seven step leak resistant Biolock™ cartridge. Protecting patients from cross contamination is an exceptionally important factor in deciding on what equipment will be used in a practice. Once you compare the SkinStylus™ Microtherapy System to ANY other professional system, the choice is overwhelming clear that the SkinStylus® needling device provides features and benefits not available in any other system at a reasonable price point. SkinStylus® is owned and operated by a team of skin care and medical professionals who have been offering microtherapy training for years and are currently using the system in their own practice. By replacing commissioned sales people with non-commissioned Educators that actually use SkinStylus® and provide useful information, we can offer SkinStylus® at a lower price and actually increase client support. Click HERE to find out more about the SkinStylus® Professional Microtherapy System. Is the SkinStylus® Microtherapy System FDA "Approved"? The SkinStylus® Microtherapy Device is registered with the FDA as a Class 1 cleared device under 21 CFR 878.4820. FDA Class 1 devices are not required to pass 510(k) clearance and as such, are not required to be “approved”. However, FDA Class 1 devices are required to be registered. This means that the importer or manufacturer of the device must pay the FDA registration fee and register both the firm and the device, as well as list any importers. The importers must also pay a yearly fee and register with the FDA. FDA indications for Class 1 devices under this section are: General Dermabrasion, Scar Revision, Acne Scar Revision, and Tattoo Removal. International and American physicians and those working under the direct supervision of a physician have submitted photos and data showcasing expanded functions of the device. Purchasers and users of the SkinStylus® Microtherapy System are strongly urged to comply with the above listed FDA indications and any state or local licensing restrictions for its use. The contents of this website are provided for informational purposes only and is not intended as a substitute for the advice of a physician or other health care professionals. What active ingredients are incorporated into SkinStylus® Microtherapy System? EstheCeuticals® offers a complete line of Home Care, Microtherapy, and Laser products with active ingredients carefully selected to maximize each treatment’s outcome (beautify the skin) and minimize discomfort and down time for the client. In keeping with FDA regulations, EstheCeuticals® are designed to beautify the appearance of the skin. Click HERE to find out more about our entire EstheCeuticals® line! What training is available with the purchase of the SkinStylus® Microtherapy System? Our classes are available online, live in-person, and a hybrid course that combines online didactic training with hands on experience. At the completion of the training, attendees will be able to confidently administer the SkinStylus® Microtherapy System to their clients and reap the rewards of the latest innovation in skin care. At SkinStylus®, we have developed curricula (including the course above) for physicians and other skin care professionals. Some of our curricula discuss scientific concepts, images, videos, procedures, and opinions that were intended for physicians who have the ability to use microtherapy devices in a variety of expanded functions and procedures. It is essential that all attendees of SkinStylus® courses, regardless of licensure, comply with all FDA, state, and local restrictions regarding the use of any microtherapy device (or any device for that matter) with respect to his/her specific licensing and to the specific indications authorized by any governing body. SkinStylus® courses are designed for informational purposes only and both SkinStylus® and Esthetic Education LLC does not purport to furnish legal advice. Additionally, the content of this website are for informational purposes only. How is the SkinStylus® Microtherapy System superior to traditional microneedle roller devices? Manual microneedle rollers may tear the skin as the needles penetrate and are simultaneously moving sideways as the roller is rotated across the skin creating micro tears instead of microchannels. This unintentional tearing causes unnecessary bleeding, bruising and post operative discomfort due to the rolling cyclinder design of the manual micro needle roller. These microrollers are expensive and cannot be reused. Proper administration of microtherapy often necessitates adjusting the depth of needle penetration and with manual microneedle rollers, this requires the use of yet another expensive microroller set to a different depth, doubling (or more) your treatment consumable cost. Additionally, the large roller design makes it difficult to impossible to maneuver in delicate areas such as the upper lip, nose, and close to the eye region. Unlike manual microrollers, the SkinStylus® Microtherapy System incorporates a state of the art automatic microtherapy stylus that uses a vertical reciprocal motion to rapidly create microchannels through the skin to a preset depth, eliminating tearing and simultaneously delivering topicals (to beautify the skin). Research has shown that patient comfort is increases with the use of a vibrating stylus during treatment. Used in conjunction with the Airstylus™ and EstheCeuticals®, significant treatment results can be obtained with each client. REMEMBER: The SkinStylus® Microtherapy Device is registered with the FDA as a Class 1 cleared device under 21 CFR 878.4820. Indications for devices under this section are: General Dermabrasion, Scar Revision, Acne Scar Revision, and Tattoo Removal. International and American physicians and those working under the direct supervision of a physician have submitted photos and data showcasing expanded functions of the needling device. Purchasers and users of the SkinStylus® Microtherapy System are strongly urged to comply with the above listed FDA indications and any state or local licensing restrictions for its use. The contents of this website are provided for informational purposes only and is not intended as a substitute for the advice of a physician or other health care professionals. Can the SkinStylus® Microtherapy System be combined with other treatments such as fractional laser? As the SkinStylus® Microtherapy System is minimally invasive, the recovery is much faster than with most other treatment modalities. Microtherapy with the SkinStylus® can be alternated with other treatments such as fractional laser therapy, chemical peels, IPL, and other modalities (based on physician preference). Secondly, the AirStylus™ can be used after laser treatment to apply EstheCeuticals® products that dramatically enhance the results of these treatments (beautify the skin). What is the AirStylus™ and how does it compare with an “oxygen facial” O2 concentrator? The air we breathe is comprised of 21% oxygen. Oxygen concentrators cost between $1200 -$4000, require a prescription, and claim to offer therapeutic benefits due to a higher concentration of oxygen (80-90%). As there is little to no peer reviewed research to support the therapeutic effects of concentrated oxygen with respect to skincare, the Airstylus™ was designed to use pressurized ambient air to propel EstheCeuticals® during the SkinStylus® treatment. The high quality compressor in the AirStylus™ device costs far less than the oxygen concentrator being marketed to skin professionals for oxygen facial use. Can the SkinStylus® Microtherapy System be used on all skin types? Unlike laser, IPL, and chemical peels, the SkinStylus® Microtherapy System can be used on all skin types without fear of hypopigmentation, hyperpigmention, burning, and most importantly, recent mild to moderate sun exposure. Gone are the days of rescheduling due to the client having been at the pool prior to treatment. Is there research to support the SkinStylus® Microtherapy System? Significant research has been done on collagen induction therapy, microtherapy, and transcutaneous cosmeceutical delivery. We have compiled a synopsis of the research supporting the SkinStylus® Microtherapy System. During the didactic training session, our expert instructors give a detailed review of this research. In keeping with FDA guidelines and state or local laws, the SkinStylus® needling device was designed to beautify the skin. As such, it is a Class I FDA registered Device. International and American physicians have submitted photographs, data, and protocol suggestions that could be considered expanded functions of the system. Any use of the system outside of it’s FDA indications are not recommended by SkinStylus® and are performed at the sole discretion of the individual physician. Who can use SkinStylus® Microtherapy System? The SkinStylus® Microtherapy System was designed for skincare professionals including doctors and nurse practitioners. If state and local laws allow, those working under the direction of their medical director may be able to use the needling device at the discretion of the medical director(s). REMEMBER: The SkinStylus® Microtherapy Device is registered with the FDA as a Class 1 cleared needling device under 21 CFR 878.4820. International and American physicians and those working under the direct supervision of a physician have submitted photos and data showcasing expanded functions of the device. Purchasers and users of the SkinStylus® Microtherapy System are strongly urged to comply with the above listed FDA indications and any state or local licensing restrictions for its use. The contents of this website are provided for informational purposes only and is not intended as a substitute for the advice of a physician or other health care professionals. PLEASE CHECK WITH YOUR STATE REGULATORY AGENCIES FOR ANY RESTRICTIONS OR REQUIREMENTS AS ESTHETIC EDUCATION LLC, IS NOT RESPONSIBLE FOR ANY UNLAWFUL USE OF THE SKINSTYLUS® MICRONEEDLING SYSTEM. How does the Biolock™ needle cartridge technology protect my clients from bloodborne contamination? At SkinStylus®, we are a company of practicing skincare professionals bringing microtherapy education and technology to other skincare professionals. We take operator and client safety seriously. Our testing has revealed that every needling device we tested (at least five major pen distributors) are using needle cartridges that allow contamination to enter the motor unit and then potentially come into contact with other clients as the device itself cannot be sterilized. The SkinStylus® Microtherapy System has addressed and solved this issue with the development of the Biolock™ needle cartridge technology that isolates fluids from exiting the cartridge and entering the needling device. Additionally, SkinStylus® is the only motorized microtherapy device that can be autoclave sterilized. This protects our clients and gives us peace of mind. We STRONGLY ENCOURAGE owners of other microtherapy systems to find out if their clients are at risk. Biolock™ cartridges are gamma ray sterilized to ensure initial sterility. 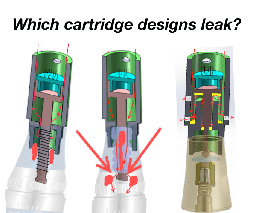 Please feel free to contact us and we will provide any information we have with respect to cartridge safety design. Please contact us so we can answer any questions you may have about the SkinStylus® Microtherapy System.